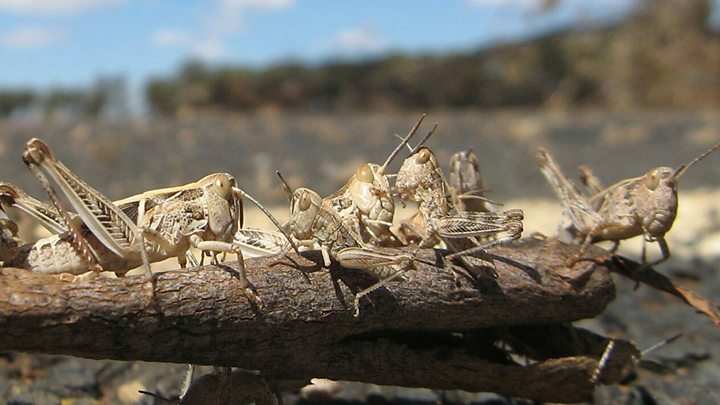 Villagers on a tiny Greek Aegean island, Agios Efstratios, are battling a plague of locusts and a state of emergency has been declared there. The island has about 200 residents who rely on agriculture and fishing. Locust infestation is a recurring problem. A member of the local administration, Stella Spanou, told the BBC that sheep were starving as so much vegetation was being devoured by the locust swarms. Students from Athens have sprayed the pesticides diflubenzuron and spinosad. "It's difficult because of the landscape - they have to go on foot. The eco-friendly chemicals are working, they got good results," Ms Spanou said. "But there are still many locusts because they couldn't spray everywhere." The students, from the Agricultural University of Athens, sprayed under the expert supervision of scientists. 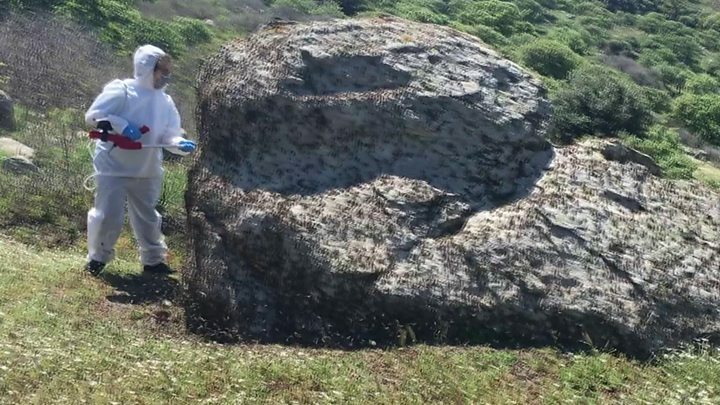 They got a special government permit for the pesticides because those chemicals were not registered for use against locusts, team leader Antonios Tsagkarakis told the BBC. The island, 30km (19 miles) south of Limnos, has one village, where vegetable gardens are being destroyed by the locusts. "The chemicals cannot be used in the village," Ms Spanou said. Agios Efstratios is part of the EU's Natura 2000 conservation network - it has a special status because of its rare flora and fauna. The island is not a big tourist destination. By July-August most of the locusts will have disappeared, Ms Spanou said, but the problem is that they keep coming back. The swarms are not thought to be migratory. Next year, Mr Tsagkarakis said, the Athens students will use a geographic information system (GIS) and drones to help fight the locusts. The Greek island's caves, cliffs and pools provide habitats for monk seals, falcons, seabirds and migratory birds. The island's important vegetation includes rare Valonia oak (Quercus macrolepis), sea daffodils (Pancratium maritimum) and extensive seagrass beds (Posidonia oceanica). "Many times we asked the government to declare an emergency, but it is expensive to do so. They acted this time because the problem is really big. It means we can overcome bureaucratic problems and do things much quicker," Ms Spanou said. Compensation for the islanders - perhaps in the form of a tax deduction - is under discussion.